I wish I could set up myself to be more organised and post regularly. Man, there’s something about blogging I love… Helps you reflect and relax that’s part of the reason I would not make it an obligation, because it’s fun but I need to be more regular that’s for sure. I thought I would make a quick October beauty favourites post, I also really want to do a blogpost with my own favourite Instagram post of the month… Will see… It will surely happen after this. The first beauty product I loved this month is my NARS Laguna bronzer… Tried it when it was in a palette, hit pan on it, bought the actual full size bronzer, hit pan on it too.. Man, I never hit pan on anything (apart from that Chanel healthy glow powder maybe)… I love the colour and the fact that the slight shimmer on it doesn’t show up on the skin. It’s all about this healthy glow, it looks very natural on medium skin tones. I also use it on my eyes as all over or crease eyeshadow to warm things up and it is gorgeous! The second product has an entire article to its beauty linked here: Tom Ford lipstick in Indian Rose… Stunning and so luxuriously! I wore Armani Si perfume samples pretty much all month… That what happens when I am deciding on whether I am going to buy a perfume. Turn out it might be another of those Christmas present to myself later on this year ahah. The smell is rich, but still sweet… Very womanly and grown up. When I wasn’t wearing the Tom Ford lipstick, I was switching things up with the Maybelline elixirs.. Got them half price on offer in my supermarket. Oh well, those feel a lot more expensive than they actually are (even full price). 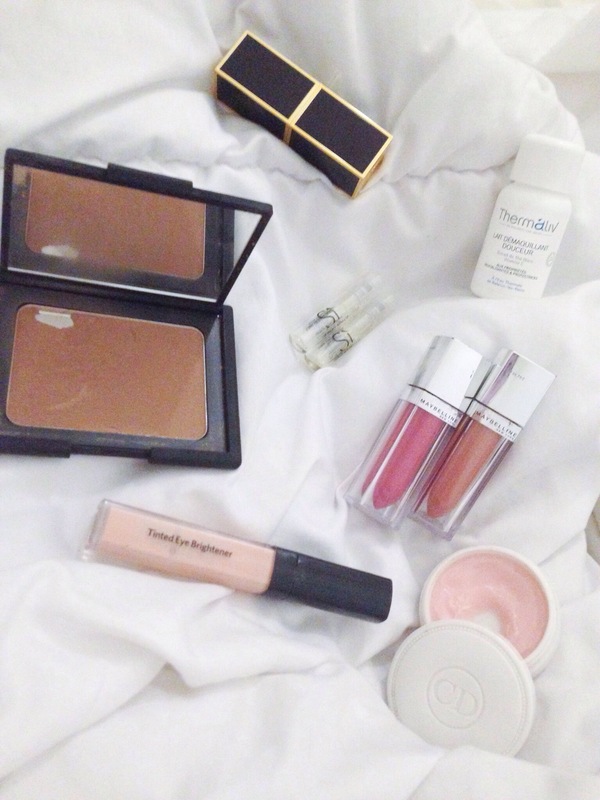 These are a great everyday option for those days of low maintenance makeup. I slap these on in the morning, at lunch they are still on and smell yummy… The pigmentation is not opaque but it is not what I am looking for in an effortless everyday makeup look. I just hate topping on makeup through the day dunno why… Needs products to be long wearing and awesome… Those clearly do the trick. The Dior creme de rose lip balm is an everyday staple, the day in my handbag, the night on my dressing table. A great luxurious lip balm… Let me know if you would like to see an article on an eventual dupe.. Because I have a good one. The BOBBI BROWN brightening concealer is actually a good one, considering this is quite sheer. The corrector BOBBI BROWN creases on me like no other, this one is a good alternative for people who prefer a more moisturising and more liquid formula. Thermaliv make-up remover milk is an amazing product I discovered in my first month (French) Birchbox subscription, I simply can’t live without it at the moment… it actually changed my skin. Having sensitive skin, it is difficult to find product that are effective but not damaging. It doesn’t break me out and does not need water to be super effective.. means I have the right to be lazy, and my skin loves it. What else? what were your favourite beauty things last month? Previous PostPrevious The Blue liners.